The Badger 5XP garbage disposal from InSinkErator is the perfect choice for anyone on a tight budget that still wants a strong, reliable garbage disposal. It has a galvanized steel construction, which is built to last. So, you can rely on your investment. Not only that, but InSinkErator offers a 3-Year We Come To You® limited warranty. So, you can be doubly assured that your investment will be worthwhile. That warranty covers both labor and parts in the event that your disposal needs repairs. The Badger 5XP comes with a powerful 3/4 Horsepower Dura-Drive® Induction Motor, which will chop up leftover food quickly and easily. It’s an economical and environmentally friendly alternative to throwing all of your food scraps in the trash. It will also be a real time-saver in the kitchen. Another interesting feature of the Badger 5XP is that it is made in the United States. In fact, InSinkErator is the only company that makes garbage disposals primarily in the United States, with only 20% outsourcing. So, if you want to support the United States economy, this disposal model will certainly do that. Whether you are installing the InSinkErator 5XP as your first disposal or replacing an older model, the process is easy. It comes with a Quick Lock® Sink Mount. Although, the power cord kit is not included. It must be ordered separately. 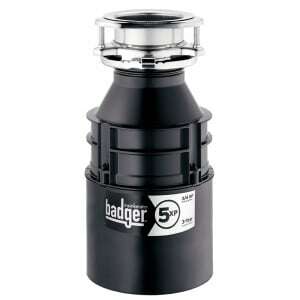 Click for more information on the InSinkErator Badger 5XP Garbage Disposal. If you hate throwing out a lot of wasted food in your kitchen trash, you definitely need a garbage disposal. Any disposal will cut back on your kitchen waste, save you time, and possibly even save you money you would otherwise spend on trash removal. But the InSinkErator Badger 5 isn’t just any disposal. The Badger 5 runs on a ½ HP motor, which is plenty of power to slice, dice, and shred leftover food as you pour it down your drain. The Dura-Drive® induction motor can stand up to all of the standard food waste, and the Badger 5 is also made out of galvanized steel. That means that it’s built to be sturdy and tough. When you’re ready to install your InSinkErator Badger 5, the Quick Lock® Sink Mount will make the process simple. It can be done in a matter of minutes, but you will have to order the power cord kit separately. The majority of InSinkErator’s product parts are made right here in the U.S.A. InSinkErator is proud to back up all of their products, which is why they offer a 2-year limited warranty on the Badger 5. That makes it a great disposal for those on a tight budget who still want a product that is built to last. Click for more information on the InSinkErator Badger 5 Garbage Disposal. If you’re in the market for a garbage disposal but you’re on a budget, it doesn’t get much more budget-friendly than the InSinkErator Badger 1 garbage disposal. This little disposal might be small, but it still packs a punch. Its space-saving design and compact size are perfect for any kitchen. The 1/3 Horsepower Dura-Drive® Induction Motor guarantees that the Badger 1 can easily dispose of most regular food waste. It’s also made out of strong, sturdy stainless steel. So, it can stand the test of time. Over its lifetime it can quickly pay for itself by saving you time in the kitchen, as well as reducing your curbside trash pickup costs, and even making your kitchen smell better on a daily basis. 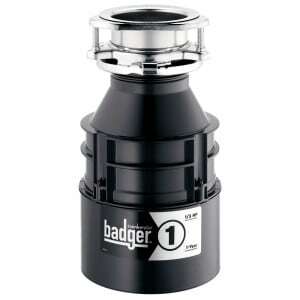 Installing your Badger 1 garbage disposal is easy. It comes with a Quick Lock® Sink Mount, which will allow you to install it with minimal effort. Just keep in mind that you will have to order the power cord for it separately, since it doesn’t come with the disposal. InSinkErator offers a 1-year We Come to You® in-home service warranty. So, if you have any trouble in your first year, rest assured that it will be taken care of. InSinkErator products are made from parts that are primarily manufactured in the U.S.A. They strongly support all of their products, including this sturdy little Badger model. Click for more information on the InSinkErator Badger 1 Garbage Disposal.